A constraint that evaluates to true when the value defined by the dynamic operand evaluates to be within the set of values specified by the collection of values. 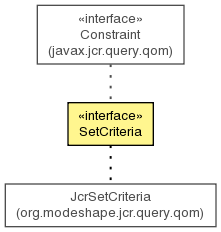 Get the dynamic operand specification for the left-hand side of the set criteria. Get the static operands for this set criteria.